The regional Trek rep got Byron a new Madone hooked up with some Aeolus 5.0 wheels for an extended test ride prior to the Ride the Best tour which stops tomorrow at St. Edwards Park in Kenmore, WA. I went to pick it up yesterday for a little test ride to take it through the paces. Short verion: It’s a nice a stiff bike (which I like) in a rather impressive package. The bike looks as cool in person as it does on the flashy website. The 110 stem on there was too short for me. Combine that with the tall headtube and spacers they had set up and I was too high on the bars to mimic my normal position. What was interesting to hear when talking to Dax was that you could actually pull out over an inch of spacers (including the cone spacer) to get a lower position. Match that with my 130 stem and I’m sure I’d be back to where I’m comfortable. Talking with Byron, he said the sensation of the lower top tube took some getting used to, but I really didn’t notice it. What’s nice is that they actually offer a huge array of sizes. They even got a guy who was 6’5” on the 62cm frame pretty comfortably, and this year they extend the range to the Power Forward size of 64cm! The Look: I really like the look of the new bike. I’m not a huge sloping top-tube guy, but this one looks rather nice. It’s the “Performance Fit” which means it’s a little more “recreational” a geometry and I think actually will result in a little more slope than the Pro Fit bikes will have. The deep wheels make any frame look cool, and the black spokes and hub make for a nice sleath overall look. The Ride: – UPDATE – Today I swapped back and forth between bikes and confirmed the stoutness of the new Madone. I think the 1.5” bottom headset diameter helps sure up the front end, but that BB gives everything back for your efforts – The bottom bracket does feel more solid than my 2007 Madone. I’m sure that has something to do with the 90mm BB shell. The front end is really quite solid and feels stable swooping through a corner. This was a little surprising because I expected to comprimise cornering with the new sloping design. Climbing out of the saddle it was really solid – no sense of wasted energy. When I wound it up to sprint, again the stout BB was noticeable and it felt good putting down some Watts. The Wheels: The Aeolus wheels aren’t for me, but they got a lot of comments at the test ride today. They are beautiful, and I think that once they are up to speed – they roll real nice, but they don’t suit riders like me. I think they are great for guys who spend the day riding solo, or in a nice even paceline, but for me if I’m not accelerating, I’m probably slowing down. The clinchers rode fine, and for someone interested in long-distance events where they keep a good hard pace I think they are probably perfect. When I sprinted on them they just seemed a little slower than my carbon tubulars. I think they are “Rouleur” (think Jens Voigt) wheels. The Trim: Apart from the stock stem being short, the Bontrager stuff is nice. I was happy with the saddle which sort of surprised me. The seat mast was pretty easy to adjust and as a nice side-feature – your saddle is always straight. The fork/frame integration is visually stunning and the carbon headset spacers finish the clean look. 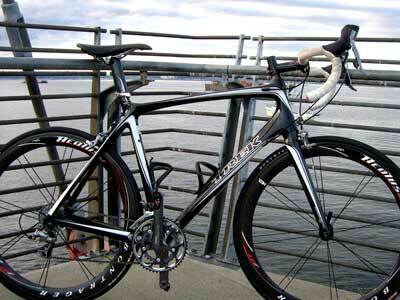 The bike was outfitted with Ultegra SL with a compact crank. I’m not much for a compact crank, but if you gave me the Pepsi challenge on Ultegra vs. Dura Ace these days – I’d fail every time. The Ultegra stuff (and even the 105) is just great. Overall: – UPDATE – I think the bike is a step above the 2007 Madone offering. I think that if it’s trimmed out with light wheels/components you could make a 15lb race-ready rig pretty easy.